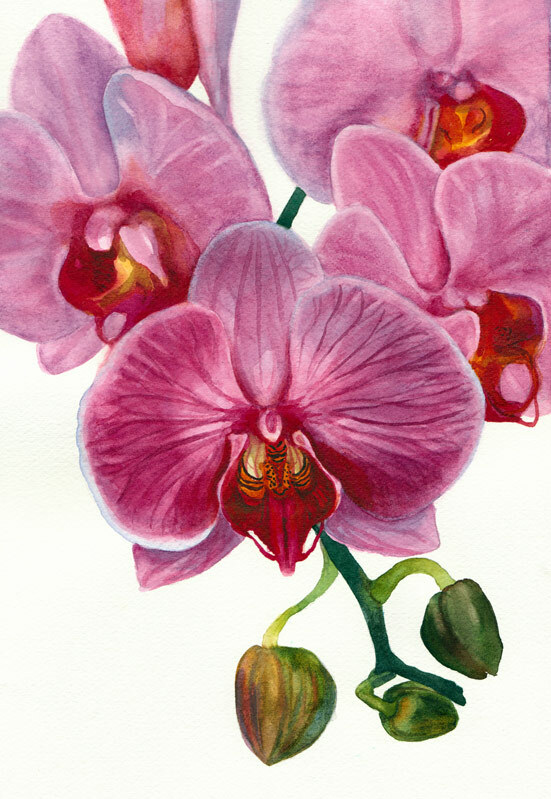 Orchid Painting in Watercolor for the book but…. Orchid painting in watercolor, 8.5" x 11.5"
So here’s the frustrating thing: I learned that the publisher wants me to write the text accompanying the step by step photos as instructions (first do this, now do that) rather than a description of what I’ve done. Sometimes watercolors go as planned and that would be simple to do, because what I did is how I would tell someone else to do it. But with this painting there was just as much taking off of paint as there was putting it on. Some of that was about softening edges with a damp brush and then blotting, but some of it was just removing paint that wasn’t working. I’ve never seen a “how to” book that says paint on a nice wash. Now wipe it off. My biggest problem with this painting was the photo I had to work from. Like many artistic photos of flowers, it was shot without shadows or directional light and therefore everything was very flat with little dimensionality. Even more difficult, everything except the front center flower was intentionally out of focus. That makes for a lovely photo but not an easy watercolor painting project. And there is no variation in color: they’re all just cotton candy pink with dark magenta veins. And I picked the stupid photo and thought it would be easy. But for me, what is easy is lots of detail and variations in color, shape and value. I started over four times, each time getting a little further and then abandoning ship. If I was just painting for myself any of those starts would have been fine and enjoyable to paint but I was finding myself exaggerating shapes and colors and losing fidelity with the photo. I think I’ll send a photo of the painting to my editor and see if she even likes the painting. My persistent (compulsive?) side really wants to paint the painting again, trying to do it more simply and cleanly. But my (sane?) side says “Go have a bowl of ice cream and watch a movie.” I wonder which side will win and how late the ice cream shop is open? At first I wanted to be able to paint so realistically that my painting would be like a photograph (yeah, right). But painting has the extra benefit that you can alter your representation of your subject. You can improve composition, express your emotional reaction to the subject, let the watercolors do their own magic, and probably a few other things as well. Good luck deciding what you want to do with the painting, if anything. I hope you went for the ice cream and movie tonight! I understand your frustration and sympathize! Whatever you will decide to do about the painting, after you had your ice cream and a movie, will be useful and beneficial for your readers, I am sure of that. I also wanted to mention that there is a book that talks about putting in a nice wash and then wiping it off. That’s Nita Engle’s “How to make watercolor paint itself.” There is a whole chapter where she talks about making mistakes and correcting them, changing her mind about large portions of her paintings, and about altering the design because it didn’t satisfy. The reality of watercolor is that it can be unpredictable, and that artists do alter it. I think if you use the existing painting and tell the real story how it was created, many of us, readers, will be grateful because this what we all have to do. Actually Jana, I think I HAVE seen videos or at least mentions in books where people put in some color then blot it up or out for some reason. I suppose, in terms of the step-by-step how-to, you might say something along the way that occasionally–with watercolor especially–this is necessary, and sometimes even a desirable way to achieve the end. I think this is a good painting, and I like that you did what you said the photo did: forward flower in focus, others less so. What a gorgeous painting!!! I’m sorry to hear it may not work for what the editor wants…..but you should have no trouble selling it if you decide to go that route. It is truly beautiful! Ice cream, skip the movie and remember to get the hot fudge. From my own early experiments with watercolor, the ‘fixing’ is a big part of painting. That has been the biggest opportunity for learning when I’ve taken classes. (Did you take many intermediate photos? That would be great.) Painting the same image varying the composition and palette has also been helpful. What my head thinks, what my hand does, and what my eye sees don’t ever seem to coordinate unless I’ve analysed my work and given it another shot. Lovely painting so don’t worry. Oh you do have lots of advisers don’t you in the comments! KISS – ‘Keep it simple stupid’ is what they say. Make the steps simple but add a proviso – hey, I did have to blot it a bit at one stage, and, wanted to go out for an icecream in frustration! Make the text humorous at time! No-one has to paint step by step really – allow for quirks and accidental blobs and tell the readers they do not have to copy exactly. Your recent flower pics are so joyiful. Darwin would be amused too perhaps. Working from photos is really a pain, but you’ve captured this beautifully. Go for the ice cream. I would! It’s really beautiful, but I think you did the right thing to start another one for the purposes of this book. If there had been a fairly clear stage in the process where a wash was too heavy and you lightened it, it would have been possible to include a step that said “at this point, if your wash is too heavy, lighten it like this” but it sounds like your process was too complex to document on this painting. The other thing is, for the readers of this book, their result isn’t going to look anything like yours, because this is just too good–if you know what I mean! 🙂 So if you re-do it and it looks a bit simpler, that will end up being better for the book, I would think. This is a stunning painting, though, it’s really breathtaking. My humble opinion is that I find it is mostly artists/readers new to the medium who follows a step by step, which makes me agrtee with what Kathryn said: Your painting is absolutely too beautiful and complex to put into a few steps. Your readers will be heavily disappointed when they can’t get the same result. So I also agrree on simpler. Only Jana can do this one!! Beautiful painting! I agree with what everyone else here is saying, although I personally find it fascinating to hear about all the steps – and occasional mis-steps – that an artist has to go through to get to the final result. Or you could always resort to that famous MAD magazine fake ad, “How to draw a face in three steps”: step 1 – draw a circle, step 2 – draw a cross shape in the middle, step 3 – imagine a perfectly rendered Mort Drucker illustration of a face – done! But seriously, you have a beautiful painting here, no matter what you end up doing with it. So many comments and such good information that I feel like I would just be repeating what has been said. I love the painting. It’s beautiful and masterfully done. I agree with, doing it over, more simply (a 6 step simple) and/or including a mistake and make over tips section. Gasp! That is gorgeous, Jana! Dear Jana I will spend this week end rejoycing over your superb paintings.You bring joy to my heart,and encourage me to follow humbly on your steps Thank you dear Jana! Jana, I think you did a very good rendition of the Phaelaenopsis. These orchids are my new hobby and I currently have 11 of them in various colors. I really like yours. I am a firm believer in “do what it takes to get to the end result.” I found this neat saying in one of my watercolor mags: “Go ahead, Draw, scratch, paint, erase, wash, rub, ink, and sand your heart out.” Who says we all have to be purists. That’s what makes the world, and art, so interesting. I am about to start on an orchid painting. My specialty is sunflowers so this will be quite different for me. Don’t put yourself down. I love your orchids. Sharon at abqwhites@aol.com. To purchase original paintings, please click above to visit my Daily Paintworks Sales Gallery or click on the "Available" link on images on this site. For prints, sketches or watercolors see HOW TO BUY menu above, or Email janabouc@gmail.com for more information. All work on this blog is copyright Jana Bouc 2006-2019, all rights reserved. If you wish to use any of my artwork for any purpose, you must first request such use by emailing me at the email address above under Contact. I sometimes link to products I have purchased and recommend on Amazon; these may be affiliate links that return a tiny percentage to me for products purchased via those links.